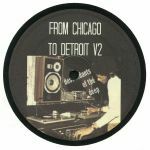 Review: There's something delightfully simple about the formula behind Descendents of the Deep's From Chicago To Detroit series, which predictably aims to bring together top-notch deep house from the Windy and Motor cities. This second installment begins with JF's previously unheard re-edit of Gari Romalis' 1995 cut "Butcher's Choice", a righteous lesson in bumpin', New Jersey-influenced deep house. It's followed by a typically emotionally-rich Larry Heard dub of Jordan Fields' 1994 cut "Lifted My Soul", before Maxi Aubert combines Heard style analogue deepness with rich, Motor City electronics on "Message In The Box". Elsewhere, there's a new JF edit of Gene Hunt's throbbing 1987 jack-jam "Native", and a wonderfully broken chunk of techno/house fusion from Africans With Mainframes.